Tabula Rasa: Why I Loved... Hop, Skip & Jump! Why I Loved... Hop, Skip & Jump! Why I Love Wednesdays is a meme hosted on every Wednesday at Reflections of a Bookaholic! Today's topic is our favourite childhood books. My favourite childhood author was, of course, Enid Blyton! My love for her started with her various books about Fairyland, and weathermen who answered toy phones and bad tooth-faries! I went on to read and love her Five Find-Outers mysteries, followed by the Famous Five series! The Book of Brownies was one of my most treasured books as a kid, handed down to me by my older sister! It was a story of three naughty brownies called Hop, Skip & Jump. One day, at the King's party, while pretending to do a magic trick, the brownies accidentally send the little princess into an evil witch's lair. They are banished from the Kingdom until they rescue the princess and bring her back. On the way they meet the strangest creatures, worms and giants and people who only talk in poems. They are trapped in the cruel Red Goblin's house and they rescue a saucepan-man from a tower of chocolate! And finally they use bottled luck to rescue the princess from the evil witch's lair and bring her back home! Exciting, right? Well, I happened to adore it. Actually, only a few months ago, I gave all my childhood books to one of my younger friends, and this makes me wonder if she enjoys them just as much! I do hope she does. Oh, oh , OH! I remember this one! I used love it so much! I had the Book of Fairies and the Book of Brownies, and the latter was the one I read to shreds. I can't believe I forgot about this one!...unfortunately, I don't have it anymore. It was given off to charity or some jumble sale or the other when my mom thought my sis and I were too old for Blyton.:-/.... I'm not sure how Brer Rabbit is still around though. *sigh* When I think childhood, I think Enid Blyton. I wonder why I cannot recall any other author...I don't believe I ever read anything that wasn't written by Blyton until was about nine or ten years old! ....except for the abridged versions of classics. Wow....I've never heard of this....but now that you've described it I am going to go get it! I loved Enid Blyton too. I had a ton of her books including Book of Brownies and Book of Fairies. I also really loved her Naughtiest Girl series. I've never heard of this one. I'll have to discover them for the first time with my little nephew. He's almost at the pay attention age. SS - It wasn't my idea; don't make me regret it more than I already do! Risa - I know what you mean. 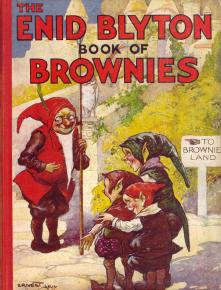 I actually believe I only read Enid Blyton books my whole childhood, that is, until Harry Potter came out! I can't believe there was a Book of Fairies and I never read it!! !